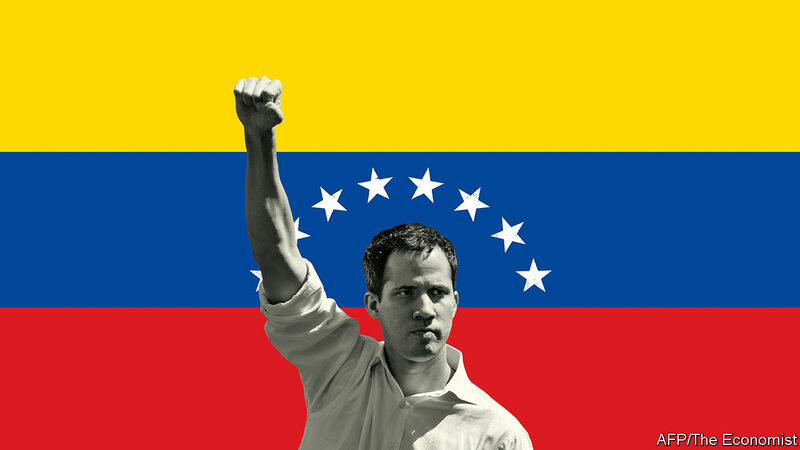 The question is not whether the world should help Mr Guaidó, but how (see article). This week the United States, still Venezuela’s main trading partner, imposed what amounts to sanctions on oil exports and on imports of the diluents needed to market its heavy oil. By ordering that payments for Venezuelan oil must be put in bank accounts reserved for Mr Guaidó’s government, the United States aims to asphyxiate the regime, in the hope that the armed forces will switch to Mr Guaidó. One danger is that Mr Maduro digs in and orders the security forces and the collectivos, organised thugs at the regime’s service, to impose terror. Another is that the United States overplays its hand. Just now it is working with the Lima group of regional governments. But its sanctions could hurt the people more than the regime. If, bent on regime change, it acts unthinkingly, it could come to be seen once again in Latin America as imperialist and overbearing. Russia is portraying the United States’s intervention as an attempt to dominate its backyard. Its media are already saying that Vladimir Putin’s interest in Ukraine is no different. The situation is a test of President Donald Trump and his foreign-policy team, including the hawkish national security adviser, John Bolton. This week Mr Bolton hinted at the use of American troops. Barring state violence against American citizens, that would be a mistake. The second way to help is to let Venezuelans know that the world is ready if Mr Guaidó takes power. The lesson from the Arab spring is that even a leader who starts by sweeping away a tyrant must bring improvements rapidly or risk losing support. The immediate priorities will be food and health care. The very fact of a new government will help stop hyperinflation (see article), but Venezuela will also need real money from abroad—international lenders, including the IMF, should be generous. The to-do list is long: Venezuela will need to remove price controls and other distortions and build a social safety-net. It must restart the oil industry, which will entail welcoming foreign investment. Its debt will need restructuring—including the debt to Russia and China which is due to be paid in oil. And amid all this, Mr Guaidó’s caretaker government must hold elections.